Excel XLSX File Password Recovery come dice il nome del programma, sblocca e rimuove la password dei file .XLSX (excel). Una soluzione giusta e rapida che riesce a sbloccare facilmente i file .XLSX quando sono protetti da una password e non riusciamo ad aprirli. Spesso capita di perdre la password di un vecchio file .XLSX che abbiamo creato e protetto con la password. Senza la password saremmo costretti a cestinare il file in quanto non esiste alcun modo per recuperare la password. Ecco che Excel XLSX File Password Recovery ci viene di aiuto, rimuovendo definitivamente la password che blocca l'apertura del file. Does your excel file got locked suddenly and are you Fed up of surveying lot to search solution for the same issue, but not found any perfect tool to recover excel file password, then do not worry, just grab the Excel XLSX file password recovery Utility once from GSTECH for finding back your excel password. GSTECH big efficient team members made a relevant tool to unprotect excel file, that later easily become your excel unlocked and user becomes able to open locked excel file quickly. This is a right online way to know how to open excel file without password loosing password it could be cause of any situation, for example: if user lost password of excel sheet or if forgot suddenly by mistake or not handed over to newly entered employees in company, which is difficult to recover password rom excel file manually, but users its not hurdle for GSTECH to solve out the issue because they have prepared an effective technology to crack excel password, which immediately gives result to user by unlocking earlier password putted on excel file. *Get compatibility of this excel unlocker tool with all excel versions such as 97/2000/2002/2003/2007/2010/2013/2016 etc. *You can recover excel file password instantly by having applicability with all Win O/S such as 95/98/2000/XP/2003/Vista/Win7. *Know it here fast for how to recover excel file password. 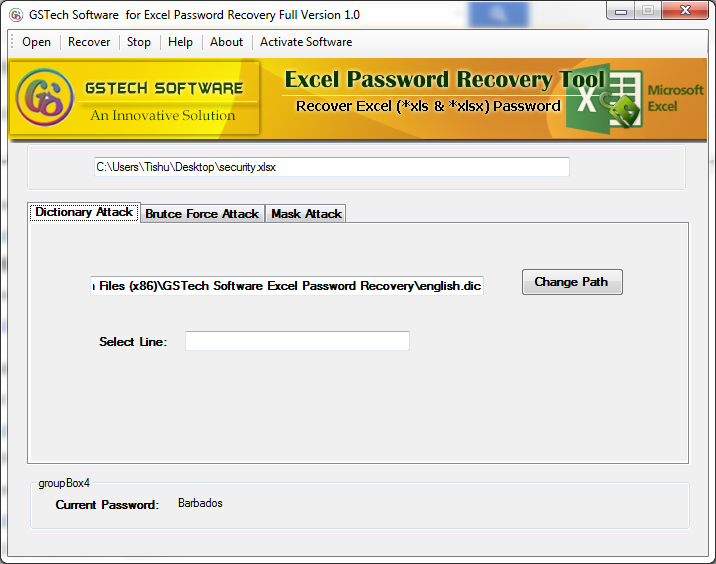 GSTECH DEMO version for Excel XLSX File Password Recovery Software, allows user to view first 3 characters of the lost password, so that user can guess properly, but for that user should be at least be aware earlier, only lost it, user can remind it quickly. But users if you never this been gone through with the password then you need to take a step ahead to purchase GSTECH Excel password recovery quickly. So obtain it now to recover password from locked excel.